This 'added value' of the first definition may take a number of forms, for example an implied invasion, a threat to the base of a group or preventing an opponent's extension in a particular direction. Here aims at an invasion next at a. In this case White's response to is entirely natural: allowing Black the big, attacking play at b would be a major loss. Both of these are examples of checking extensions by Black. In the second case we can assume Black's play is sente; but not in the first. To qualify an extension must at least be 'almost sente', in the sense of having a major follow-up. Bill: Isn't tsume more general, a kind of approach that is not an invasion, nor a kakari, nor a yose? I suppose that, in practice, such a move will nearly always be an extension, as well. John F. Bill's doubts are justified and this page is built on a false premise, really. A tsume is a move that blocks the sideways development of an opposing group. Of itself it says nothing about extending, though, as Bill says, in practice it will often double up as one. 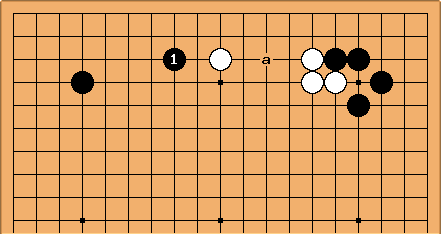 But "checking extension" emphasises extension, whereas tsume emphasises blocking. The terms hirakizume and tsumebiraki also exist; the latter is a checking extension. Tsume as in tsumego/tsumemono means abbreviated, packed in. Tsumeru as in dame wo tsumeru means fill in liberties. Charles So, it does seem that tsume should be discussed on a separate page, anyway. I've gone back to the Takagawa article and clearly I still don't take the point: see tsume discussion. 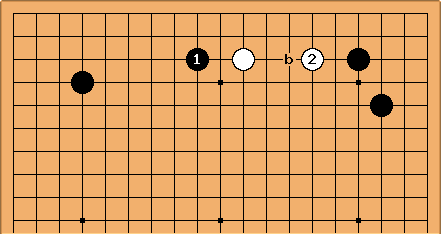 A more detailed definition is given in Joseki Volume 1 Fundamentals, where too near stones are excluded, i.e., a checking extension must not be confused with a block or move of the type connection (such as string connection or kosumi). RobertJasiek: Outside SL, the second definition is the only one I have - consistently so - seen used verbally or in English or German literature for checking extension. The "added value" then becomes "to prevent an opponent's extension in a particular direction". Every example confirms this.